It was a rough ride all through 2018 for all global markets including cryptocurrencies. This article analyses the trading behavior of Hydro token in the market from December 2018 to January 2019 giving cognizance to the general market trend. I’m considering the one-month chart to give a better picture of trading direction in the short term and the predictable movement from here onwards. Despite the optimistic calls supporting a rebound in price from high profile crypto investors and companies at the end of 2018 coming into this year, the first two weeks of January 2019 hasn’t shown we are headed up anytime soon. The market rather has fallen below the region where it has traded for the past two weeks forming a new low. 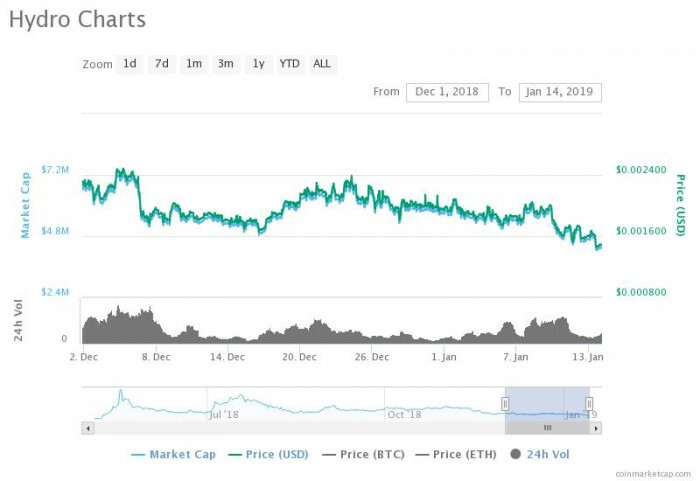 A support value was formed around the $4.8 million market cap and a resistance range of slightly above the $$7.2 million market cap all through the month of December and into January 2019. 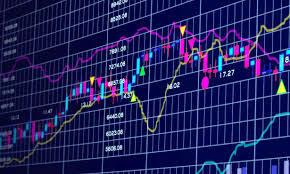 The inter day trading activities continued as usual as day traders continued to take profit from the jumps up and down within the same region which resulted in considerably high daily trading volume compared to other tokens with barely up to a hundred-dollar volume combined on all their exchanges. This article has also considered the market cap as another important index of the health and future of a coin. Based on the foregoing Hydro is in good light. In the mostly bearish month, the only price rally that tested the resistance market cap of $7.2million was rejected almost immediately. The price rally which was the only obvious jump experienced in the month lasted between 20th and 28th of December (which some called the Santa Claus rally) before it returned to the lower part of that range. 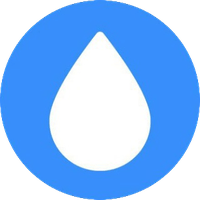 Within the period Hydro had a value of $0.002333 (0.00000056BTC). Relative Strength Index (RSI): This for most is the go-to indicator that quickly tells when to buy and when to sell. I used the RSI/14 upper boundary line of 75 and a lower boundary line of 25.
looking at the chart below, it’s seen that the price line shows more downward tendency to the oversold line before any possible trend reversal, leading to the summary that when considered in isolation, it is still not a safe buy zone for the mid to long term traders who’d prefer to capitulate at a reasonable lower price anticipating a future spike. The support price of 0.00000050BTC that held all through December into January was clearly broken in the first week of the new year to form a lower low that has been around 0.00000042BTC. A close observation of the chart shows that there could be more fall coming as the support has been tested several times within a few days in the second week of January. The MACD line is another indicator sometimes called the momentum indicator which gives the general direction of price action on the coin, whether it is going upward or downward. In the above chart the red MACD line (EMA 12 - 26) has crossed the signal line from above which can be interpreted as an indication of a further drop in the price of Hydro in the coming days/weeks until we see another trend reversal instigated by a major news in the entire market since so far it is obvious that announcements in isolation for a project alone of good partnerships like the recent partnership deal between Hydro and IBM, major project roadmap achievement are not enough to cause any significant change in price. The crypto market has proven to be cyclical in nature, and during a downward market any crypto asset will fall victim of reducing prices. It is no surprise why the price of Hydro has dropped too. A quick overview of Hydro on coincheckup.com shows that for the past 30days there is a strong sell force which is not detached from the FUD currently in the market and the bearish trend but on the other hand their algo rating shows that Hydro has a score of 3.2/5 (I personally think it should be more), made up of 80% product strength, 74%-coin strength, and 70% team strength decked with high profile team with over 10 years’ experience in the blockchain niche. 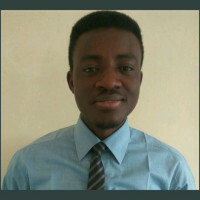 In conclusion, it is important to note that the coming days in January and the rest of the year will be dramatic for the crypto market, but like I stated in my previous article, only good projects will benefit from any favorable turn, and I believe the Hydro team is doing all to be a beneficiary while designing something that will disrupt the fintech industry in the web 3.0. It already started the year with a great deal announcement with IBM, implementation of the raindrop app on coinplan, and news of the release of snowflake app any moment from now. My take – It is buy, buy, buy time.